Not a new PB but I wasn’t expecting it today. I got up at 5:10 this morning. Oops! A little early for the holidays! Last night Dan had been going through the freezer to see what we could have for tea when he found four end pieces of bread in four separate bags! I told him to get them out to defrost and remind me to have toast for breakfast before the parkrun. This didn’t really work because they ended up being rather soggy! I ate two slices anyway though! Dan was heading back to Wolverhampton today to watch the footy so I was on my own for this Parkrun. I didn’t think I would PB as I haven’t been running great lately, but I still wanted to run the best that I could today with the aim of running sub 9mm. As I was lining up I realised that there seemed to be more people than last time and I was a little worried when I saw several children and a man dressed as a large dog infront of me but when the whistle went luckily I didn’t have too much weaving to do and the field spaced out pretty quickly. We had been warned that there were some areas which still had a few inches of snow and several areas of ice on the course today. It was not too slippy at all, but rather just meant that we had to give some corners a much wider edge than we would normally have done. As last time I was concerned about my breathing which seemed quite heavy to begin with. This quickly evened out though and I was on track with my panting! When I glanced down at my watch at about half a mile into the run and realised that I was running at 8:15mm pace I knew I was going too fast and tried to slow myself down a bit. As I came round for the second loop I started to get a pain in the left side of my chest. I broke into a walk for the distance between two lamp-posts, just to get myself back into check and then continued at a slightly slower pace. I knew I would be OK to finish strong that way so pushed on. I had overtaken quite a few people at the start but as we got closer to the three mile mark there seemed to be several people adopting a walk-sprint routine. They kept surging past me only for me to then overtake them a short distance later. This has worked for quicker times for me in the past but I much prefer to run a steady race and feel good at the end of it rather than like death as I’m sure they did! One woman overtook me literally with meters to go at the end with a quick sprint, but I knew I wouldn’t be able to match her at that late stage. She apologised as soon as we got through the finish funnel! Below are my two Northampton Parkrun pace graphs. The first is from my Parkrun PB of 26m 55s on 2nd Feb. The bottom graph is from today. 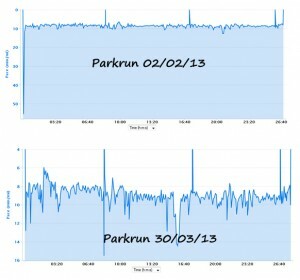 Check out how well paced my first Parkrun was compared to today! I wore my Stamford 30k top which is one of my comfiest long sleeved technical tops. This prompted a conversation with another runner that had completed the race this year. Runners really are a friendly bunch of people! My watch time was 27m 55s. 1min slower than my current PB on the same course. Overall I’m not disappointed with my race today as I know that my energy levels have been zapped just lately from work. I have learnt (again!) that starting out too fast is my downfall and I’m going to try and wear my heart rate monitor more frequently over my coming runs so that I can track the effort I am putting into my runs rather than the speed. I would like to do Parkrun more regularly…as I’ve said before, I LOVE the Parkrun concept and it will definitely help keep my pace quicker whilst I am training for my marathon/ultra over the next couple of months. Watch this space for more Parkrun results over the coming weeks! My luck has run out! 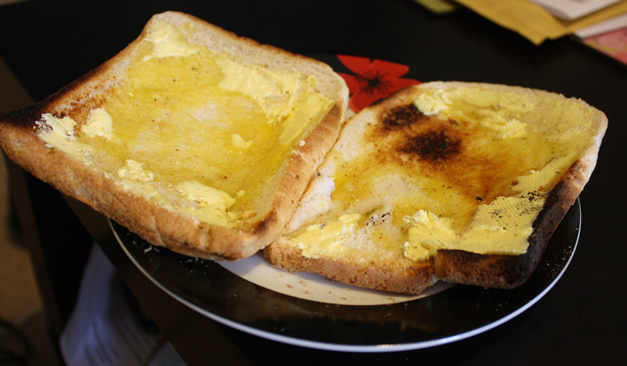 Ah soggy bread no good, at least you tried to eat it. My kind of girl haha. Awesome job on the run! Haha! Bread is the one food item I could not live without! If I went to the bakery for fresh cooked bread I could literally eat an entire loaf in one sitting I reckon! I try to be good though and now we just buy cheap pre-sliced bread and put it in the freezer so that we can defrost it one slice at a time and I don’t have the excuse of ‘It’s going to go mouldy!’ to finish it all up in one go!